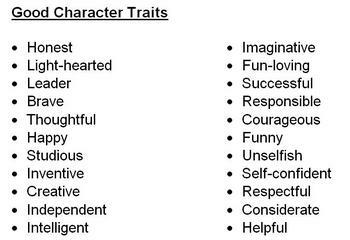 These are all characteristics, or traits. Characteristics distinguish us, and book characters, by giving them unique qualities and attributes. Characteristics are the things that make us who we are, whether we be loving or modest, it’s a characteristic. And when it comes to creating a book, movie, or play character, characteristics are an important part of doing so. When we create a book character, or rather read about a book character, we want them to have this uniqueness to them, something that makes them different from the others. Each character should be different. Otherwise, if they were all the same, it would just come out as boring and. . . dull, as simply put. There is nothing better than having a character that is special in their own way, something that we can distinguish from the rest of the characters. We want our characters to be honest, and/or caring, and many other things. We want our characters to be one of a kind. If every book, movie, and/or play had the exact same character, wouldn’t it get tiring? Wouldn’t you be bored? Wouldn’t you eventually lose interest? 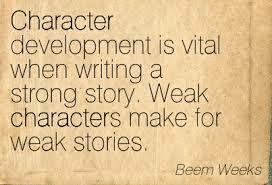 That is exactly why we need characteristics for our characters. And trust me when I say, there are plenty of characteristics to make an array of different characters. Smart. Courageous. Brave. Determined. The list goes on and on and on. There is no possible way for me to list every single characteristic, but I have listed a few of them in this post already. There’s a possibility that we can never run out of characteristics to make our characters. We all want to open up a book to the first page, and know that the story will be different. Different plot, different characters, different genres. We do not want every book to have a character that is kind, caring, and intelligent. Why not have a distinct variety of characters? Unless the book’s sole purpose is to have each and every character be completely the same, then we need to have the unique individuals. I mean, depending on the book, the character might need to be brave, or clever, or both. The character might need to charming, but clumsy, and the villain might need to arrogant and caustic. The girl might need to be compassionate, and decisive, because, let’s face it, a lot of people do not like indecisive characters. Books might need elegant queens, idealistic villains, and humble servants. Each character needs characteristics to make them them. We need good characteristics for heroes and the good ones, and bad, or misunderstood, characteristics for villains. It depends on the book you read or write, or the movie you watch. And this is not just in book or movie characters. We have characteristics too. These are what make us unique. Maybe I got you thinking about your own characteristics, your own traits. Or maybe you’re thinking about a book you might be writing or reading, and you are thinking about the characters. Whatever it be, they should be unique.